Learn how to go fishing in the Plains of Eidolon in Warframe. One of the best new features of Warframe’s Plains of Eidolon expansion is the ability to go fishing. While traversing the open landscape of the Plains of Eidolon, Tenno can stop at nearby bodies of water to catch various types of fish, which can be traded for additional Standing or other resources. This guide will explain everything you need to know about how to fish in the Plains of Eidolon in Warframe. Before you can begin fishing, you will need to reach the Plains of Eidolon and spend some time getting to know this new Ostron settlement. If this is your first time playing Warframe since the update, make sure to visit Cetus on Earth and familiarize yourself with the locals before trying to fish. Fishing spears can be purchased from a vendor in Cetus named Hai-Luk. To go fishing in Warframe, you’ll first need to obtain a fishing spear from an Ostron fish merchant named Hai-Luk. 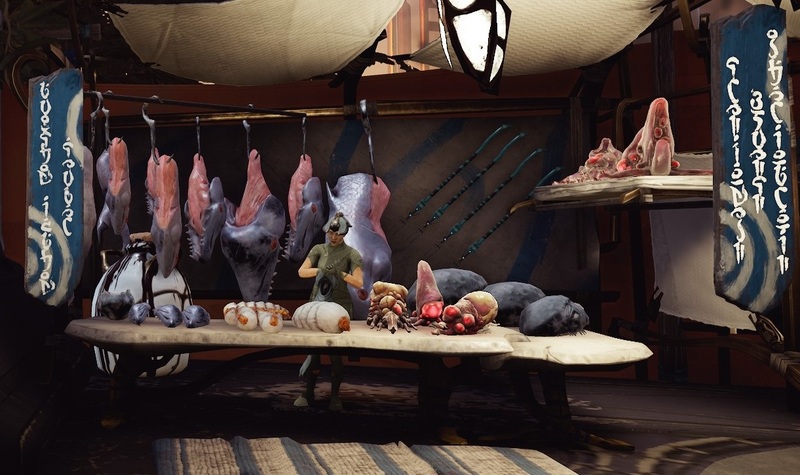 Hai-Luk is the first vendor on the left as you enter the main marketplace of Cetus from the docks. 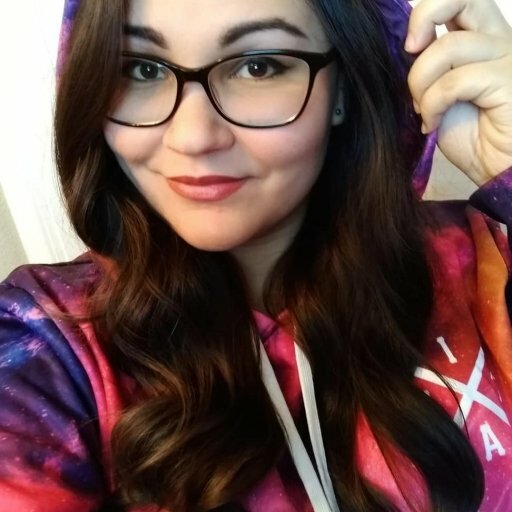 To purchase items from local vendors in Cetus, you will need to earn enough Standing with the Ostron faction by completing Bounties given to you by Konzu near the Plains of Eidolon gate. Talk to Hai-Luk and select the option to browse her wares. 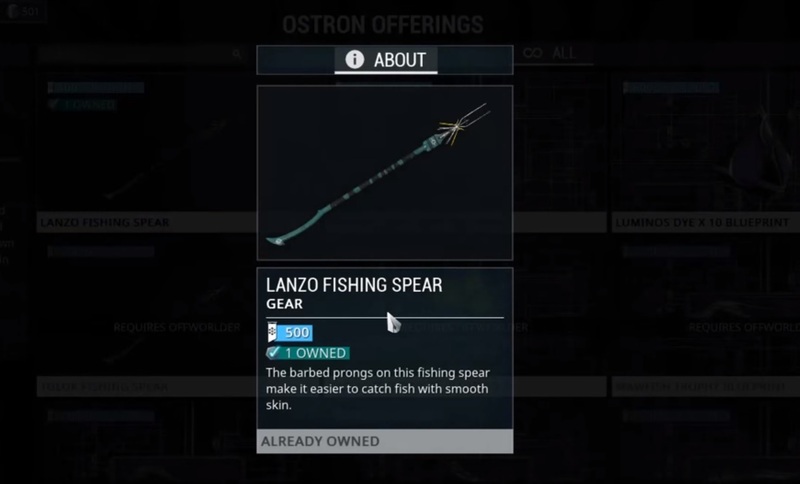 Purchase the Lanzo Fishing Spear for 500 Standing. Hai-Luk also sells the Tulok Fishing Spear, but this is much more expensive (2,000 Standing) and requires Offworlder. Fishing spears can be equipped on the gear wheel. Once you have obtained a fishing spear, you’re ready to put your fishing skills to the test in the Plains of Eidolon. Head out into the Plains and bring up your map to find a decent-sized body of water. The larger the body of water, the larger the fish. When you’ve settled on a fishing spot, approach the edge of the shoreline and keep an eye on the water. While some fish are silent, most will make a subtle noise and create bubbles in the water. This is particularly useful if the water is murky or hard to see through. Now it’s time to play the waiting game. It can take a while for a fish to appear, so just be patient. The fishing spear works similarly to a harpoon, with a retractable line attached. Keep your fishing spear out and at the ready. As soon as you spot something moving in the water, aim your reticle at it and throw your fishing spear. With any luck, you should be able to capture a few good fish depending on the location in the Plains of Eidolon. After catching a few fish in Warframe, head back to Hai-Luk and purchase a few bait blueprints. Crafting fishing bait will require Credits and certain types of fish meat, but baits can help to improve your odds at catching fish later on. Luminous Dye can also be used for spotting fish at night, which can come in handy for evening adventures. Now that you know how to fish in Warframe, no fish is safe from your spear in the Plains of Eidolon.